The Dark Side of the Moon - Essays and Articles by Jim Freeman: Liar’s Poker at the Federal Reserve--"Can't anybody here play this game?" Liar’s Poker at the Federal Reserve--"Can't anybody here play this game?" 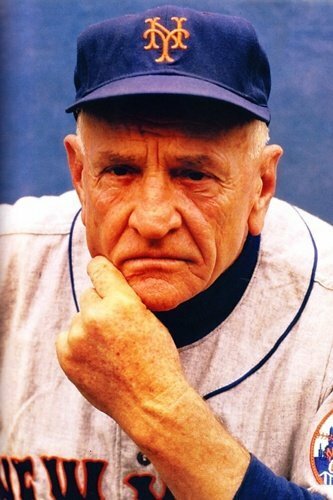 That quote’s attributable to Casey Stengel, expressing his frustration over his team's spectacular ineptitude. Spectacular ineptitude is exactly the phrase that defines Ben Bernanke’s chairmanship of the Federal Reserve throughout the Fed’s stumbling, blundering support of special interests relating to the 2007 financial meltdown. When we meekly accept ‘quantitative easing’ as an excuse to throw newly printed money at errant banks, to pay off their fraudulently accrued gambling debts, its well past time to send old Casey out to the mound to kick at the dirt, look toward the bullpen, tug his cap and wave in a new pitcher. Federal Reserve officials in August 2007 saw the beginnings of the crisis in subprime mortgages and concluded that the U.S. economy would be able to withstand it, even as some Fed members warned that it could trigger a downturn, transcripts from their 2007 meetings show. “Well-capitalized banks and opportunistic investors will come in and fill the gap, restoring credit flows to nonfinancial businesses and to the vast majority of households that can service their debts,” Donald Kohn, then vice chairman of the board, said in Aug. 2007 according to transcripts of the Federal Open Market Committee meetings released today in Washington. Stephen Friedman. In 2008, the New York Fed approved an application from Goldman Sachs to become a bank holding company giving it access to cheap Fed loans. During the same period, Friedman, who was chairman of the New York Fed at the time, sat on the Goldman Sachs board of directors and owned Goldman stock, something the Fed’s rules prohibited. He received a waiver in late 2008 that was not made public. After Friedman received the waiver, he continued to purchase stock in Goldman from November 2008 through January of 2009 unbeknownst to the Fed, according to the GAO. During the financial crisis, Goldman Sachs received $814 billion in total financial assistance from the Fed. Sanford Weill, the former CEO of Citigroup, served on the Fed’s Board of Directors in New York in 2006. During the financial crisis, Citigroup received over $2.5 trillion in total financial assistance from the Fed. Richard Fuld, Jr, the former CEO of Lehman Brothers, served on the Fed’s Board of Directors in New York from 2006 to 2008. During the financial crisis, the Fed provided $183 billion in total financial assistance to Lehman before it collapsed. At the next meeting, on June 27-28, Janet Yellen (San Francisco Fed Chairman) said the biggest risk to economic growth was housing, which she called the “600- pound gorilla in the room.” She cited the Sacramento area, where price increases of more than 20 percent a year from 2002 to 2005 had begun to decline. Sub-prime mortgage delinquency rates around the California capital “rose sharply” in 2006 to become some of the nation’s highest, she said. …The Financial Crisis Inquiry Commission’s 545-page report said regulators took “little meaningful action” against the threats of financial calamity. “The prime example is the Federal Reserve’s pivotal failure to stem the flow of toxic mortgages, which it could have done by setting prudential lending standards,” the report says. Fed officials were gathering information on mortgage markets. In May 2006, the Fed Board said it would hold public hearings on predatory lending and sub-prime mortgage products. In July 2007, the Fed announced an unusual agreement with the Office of Thrift Supervision and the Federal Trade Commission to conduct targeted consumer protection compliance reviews of non-bank subsidiaries operating as sub-prime lenders. So they knew, or should have known. But even board members at the Fed hear only what they want to hear, or what serves their purposes. The Fed, after all, is run by banks to regulate banks—foxes in charge of chicken-coops. But, we do love our ‘commissions,’ who tell us which way the horse went after the barn is finally locked. But is it locked, or has the Fed been too busy stumbling around in the dark and greasing their own members’ wheels to fasten the door? You might remember that Elizabeth Warren was actually doing something for consumer protection during crisis time at the Fed, instead of reviewing and the thanks she got was being sent home like a rookie by the United States Congress. “Too toxic a personality for the banking community,” huffed the Senators, glancing fondly in the direction of their campaign contributors. So, being a doer rather than a reviewer, Elizabeth trotted home to Massachusetts and ran for the U.S. Senate, sending incumbent Republican Scott Brown back to the minor leagues. Casey Stengel would love her. She knows how to play the game, stand up to the boys and rally the crowd in the 9th inning, when her team is two runs behind. If only we had a player like that at the Federal Reserve.